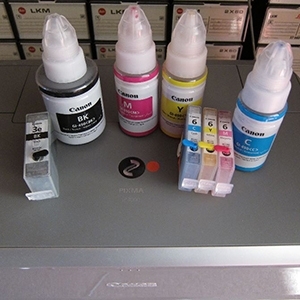 Discussion in 'Canon InkJet Printers' started by tsu3000, Feb 9, 2019. I recently connected my iP4500 to a Raspberry pi and set up a simple print server using CUPS+Guttenprint. Although the iP4500 is supported and I do get prints, I find that after a while either the printer goes to sleep, USB port goes to sleep or the something else and this stops the printer printing. All I get is the green power light flashing steadily. Under the admin pages for CUPS I can see the print job in the queue in a "processing since" state and it just sits there. The only way to reset the printer is to pull the power cord followed by a power on and re-submitting the job I do get prints again. Does anyone know of a better solution to this? As I don’t know what sort of control you can get from your Guttenprint driver, but I would suggest you try to access the control panel of the printer and set the printer to be always on, because default is sleep more..
Where is the control panel for the iP4500? I've been trawling the Internet for answers and it appears to be a common issue with the Linux kernel and/or the CUPS system just switching off by itself! This seems to happen to other makes too and not isolated to Canon. For the time being it seems the only reliable way is to pull the plug after every print run. I managed to resolve this issue. It was due to missing driver files for the CUPS system. Once these were installed the printer works as expected and does not randomly sleep or stop working. PeterBJ, stratman and The Hat like this. This has been annoying me for ages, wastes so much ink having to power cycle the printer. I don't suppose you know which file was missing?